As we draw closer to the Passchendaele commemorations, we thought it timely to send you an updated list of Centennial events that are being planned in the main centres. We are also aware of several other events in smaller towns throughout the country. Please check with your local RSA or you can see more events listed on the WW100 website. Wednesday 4th October: Centenary of the Battle of Broodseinde. Eden Park (Free guided tours starting hourly 9am to 6pm). Sunset Ceremony commencing 6.30pm. Please see Mates on the Field mentioned in E-news#31. Thursday 5th October: Installation of Passchendaele Field of Remembrance. Auckland Domain in front of AWMM (Blessing Ceremony 10am). Thursday 12th October: Passchendaele Field of Remembrance Service. Auckland Domain (Remembrance Ceremony 10am). 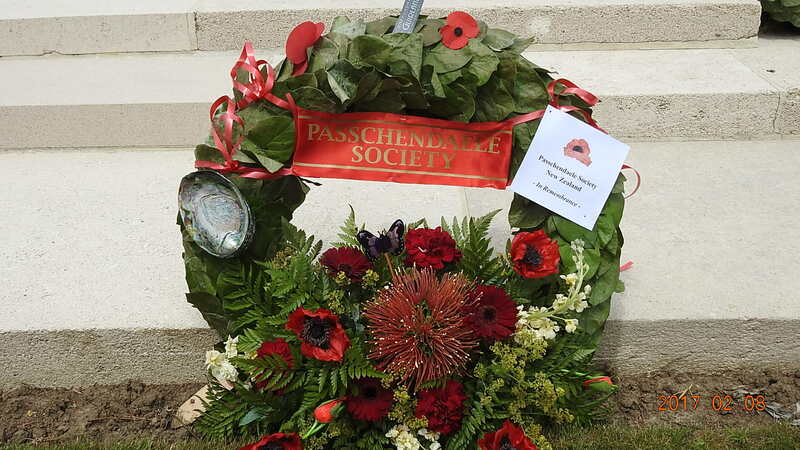 Thursday 12th October: Passchendaele Centennial Commemoration. Auckland War Memorial Museum (WWI Hall of Memories 11am, members are advised to be seated by 10.30am). After our 11.00am commemoration, all attendees are invited for complimentary light refreshments served in the Events Centre upstairs at the Museum (12.15pm until 1.15pm). Sunday 15th October: Passchendaele Memorial Concert. Bruce Mason Centre, Takapuna Auckland (2.30pm). Please see E-news #31. Since the printing of the flyer, the NZ Police Auckland Choir has been added to the cast and the Guest of Honour is the Rt.Hon. Sir Don McKinnon. Friday 20th October: Disestablishment of Passchendaele Field of Remembrance. Auckland Domain in front of AWMM. (Blessing Ceremony 10am). Thursday 12th October: The national ceremony will be held at Pukeahu National War Memorial Park and is being hosted by WW100 (Remembrance Ceremony 3pm). This will be followed by the unveiling of a memorial gifted to New Zealand by the Belgian Government. Both the ceremony and unveiling will be live streamed on the WW100 website and Facebook page. The public will also be able to watch the live stream from 3pm at Te Marae Rongomaraeroa, inside the Museum of New Zealand Te Papa Tongarewa (Te Papa). In the event of adverse weather, members of the public would be encouraged to watch from Te Papa. Thursday 12th October: Following the ceremony and unveiling, there will be the daily Last Post at the National War Memorial at 5pm. Thursday 12th October: The commemorative programme will conclude with a unique reflective event from 6pm at Te Papa, featuring the Royal New Zealand Air Force Band. Friday 13th & Saturday 14th October: The 7WnHB Regimental Association is organising commemorations in Lower Hutt. Please contact Campbell Sutherland for more information on: acsutherland@xtra.co.nz. Thursday 12th October: Christchurch Memorial RSA is planning to hold a commemorative parade and service with wreath laying at the Bridge of Remembrance. 1st October till 30th November: 3,200 Fields of Remembrance crosses in the Park of Remembrance will be placed on the bank of the Avon adjacent to the Bridge of Remembrance to cover those the commemorative period of Passchendaele, the sinking of HMS Marquette and Armistice Day 2017. 1st October till 11th November: A Field of Remembrance will be installed around the Dunedin Cenotaph to mark the centenary. 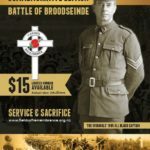 23rd September: The Toitu Otago Settlers Museum is hosting Freddy Declerck, expert on Passchendaele, who will talk at 2pm about the five battles in Flanders including the toll of war that has not only cost the lives of soldiers, but also civilians who died during the war and have been victims of WWI. The museum is also home to the “The Belgians Have Not Forgotten Exhibition” until 19th November. They are also hosting several other exhibitions. 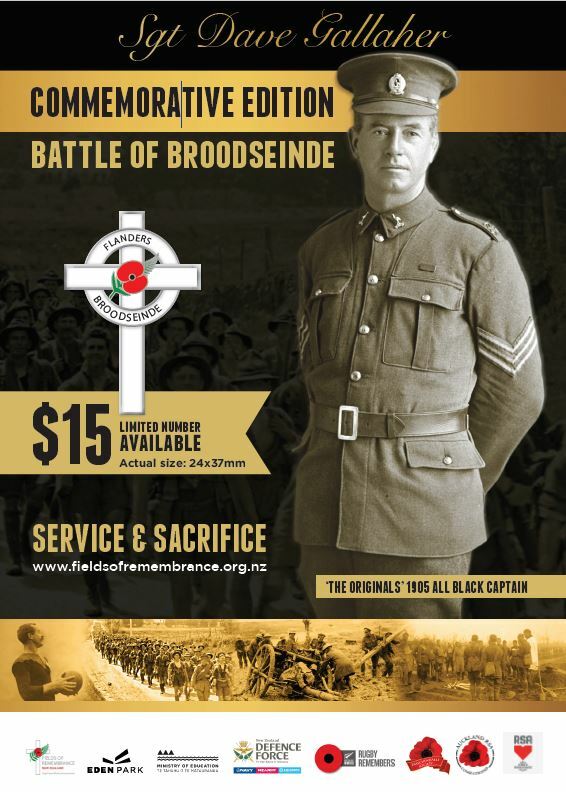 On a final note, the Fields of Remembrance Trust have produced a Battle of Broodseinde commemorative pin, this is available through the FoRT website http://www.fieldsofremembrance.org.nz/. The Battle of Passchendaele commemorative pin is also available from the website or at ANZ Bank branches for $10.